Our Beach Cruisers are the perfect vehicles for exploring the beautiful beaches of Playa Grande and Tamarindo areas during your family vacation. Kids bikes, baskets, surf racks and more gear in store. Our smallest bike is suitable for kids aged around 5 years old. 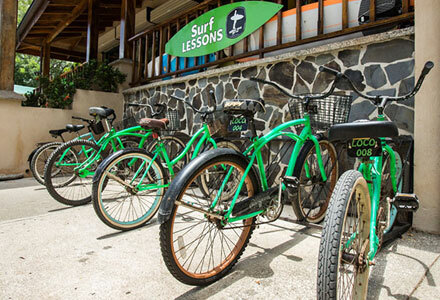 We also have small 20 inch beach cruisers, as well as 24 inch and 26 inch beach cruiser bicycle rentals for men and women. Playa Grande at low tide is a great beach to ride a bike along, and you can reach Tamarindo rivermouth within 15 minutes. 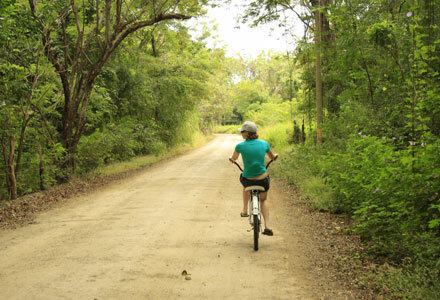 Put the bikes in the boat taxi, cross the river and explore Tamarindo and Langosta areas for an economical activity for the day. Always keep an eye on your bikes, even if they are chained up… opportunistic theft can and does occur. Better to prevent it with one of our bicycle locks. At the moment, we have two kids helmets. For adults, if you wish to use a helmet, please bring your own or notify us prior to arrival so we can arrange one for you. Please note that all rental equipment must be checked over at the time of renting. Our staff are trained to revise equipment with you, however if we are very busy, we ask that you ensure this happens. Bicycles check: tires, baskets, mud-guards etc. If there are any damages, please have these noted on your rental form prior to taking the products, or you will be required to pay for damages upon your return. Flat tires on bicycles (from thorns, puncture etc) cost $3 per tire. Broken baskets $10 per basket. Bent mud-guards from careless use will be charged for. Please take care of the equipment so that future vacationers can enjoy it too. We provide quality locks for theft prevention, however there is no substitute to keeping an eye on your equipment and not leaving it unattended. Lost or stolen locks, or irretrievable combination codes will be charged $20 per lock. 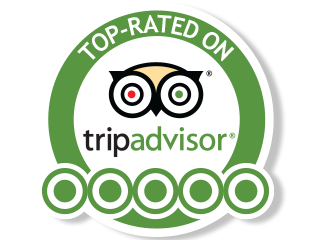 We want your experience to be a good one, knowing the rules before you take the equipment prevents any misunderstandings and an overall better experience. The folks at Frijoles Locos were great. I prepaid for 5 surfboards and bikes for the week. They set everything up and communicated well. When we arrived everything was ready. They even delivered some boards and bikes to the house and picked them back up. One of my kids traded in the board he was using for a different model without any hassles or nickel and diming us. Totally great experience. Would highly recommend Frijoles Locos!